When Mandy and I first moved into the Fox Den, we thought that the builder was going to put trim in our dining room to match our foyer. They didn’t. 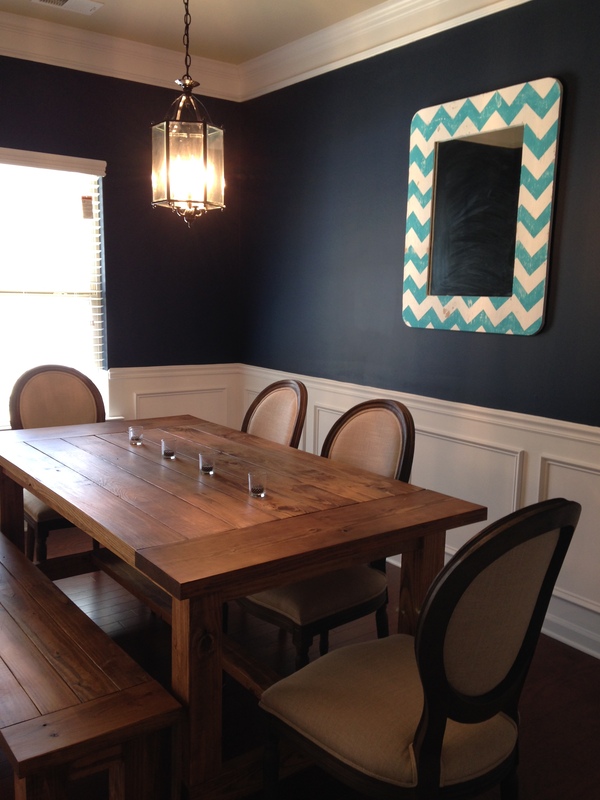 When I asked about it they wanted a crazy amount of money to do it for me and in typical Conner Volpe fashion I said “no way, I can do that myself for way cheaper.” After most of a year of it getting knocked down the priority list, ATL Snowpocalypse 2014 finally got us going on the long-awaited dining room DIY. 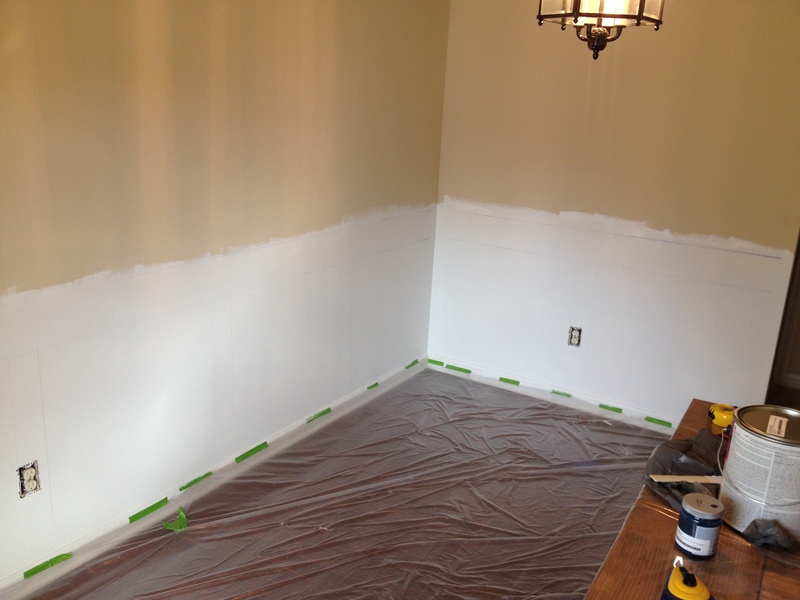 Here is the best before picture that we had…unfortunately I was too excited to start that I didn’t take more. I guess I shouldn’t say started – I had been dumpster diving in our neighboring construction sites since the day we moved in collecting pieces of trim that had been thrown away. 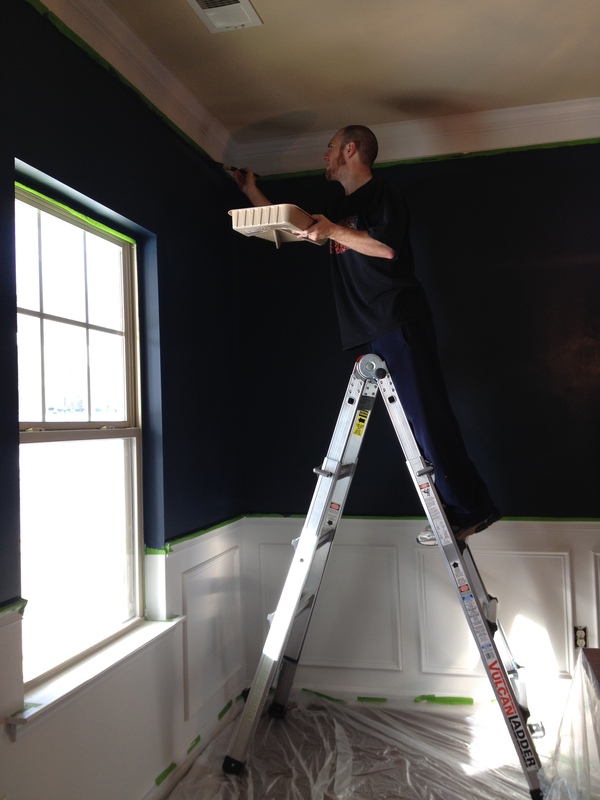 It is for precisely this reason that we were able to complete this entire project including paint, trim, and other supplies for under $125! Luckily I had gotten about half of the trim we needed from my diligent trash pile monitoring. 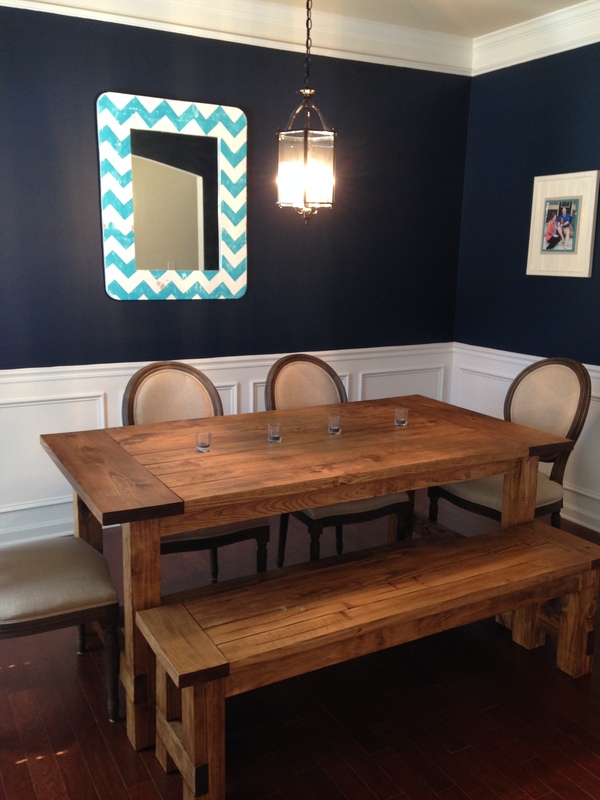 The rest came from our great friends at Home Depot, Lowe’s (they had the paint color we wanted – sorry HD friends! ), and a great local millwork company called TAPP Lumber. Once we had everything we needed it was time to plan out our approach. 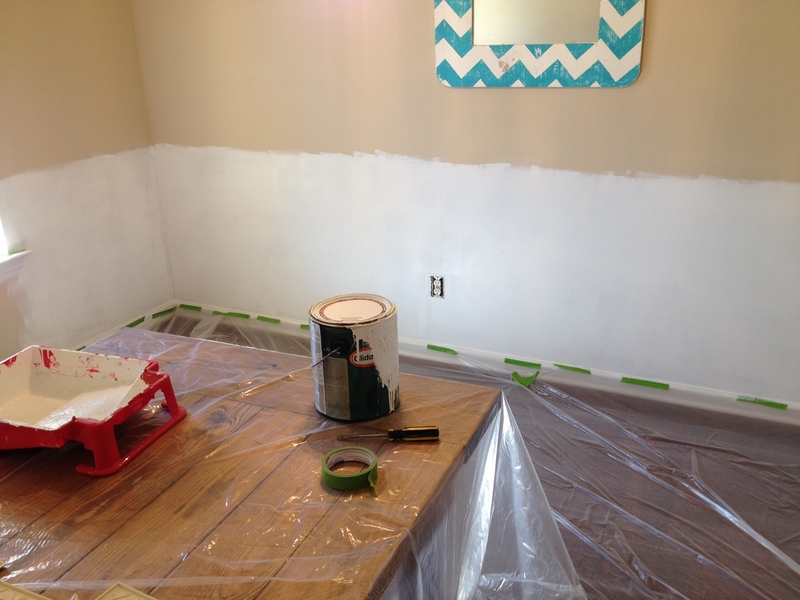 I knew I wanted to maximize the area that we could paint with a roller versus a brush so we started by laying down a drop cloth and rolling the white paint on the lower half of the room. Because we would be going back and painting the top half again later, we didn’t worry about going too high with the white paint. This made it very easy to just roll on and move to the next step. 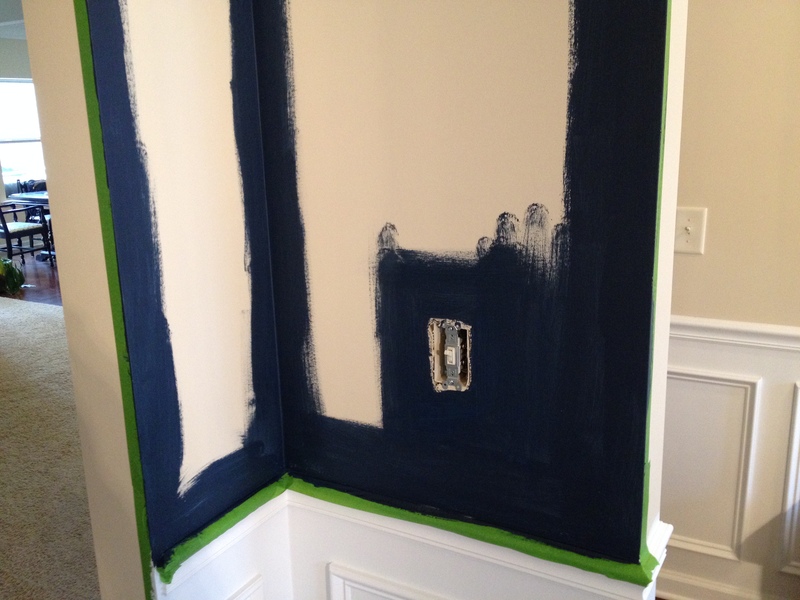 You can also see that we took the outlet covers off instead of trying to tape around them – any thing we could do to save extra effort. 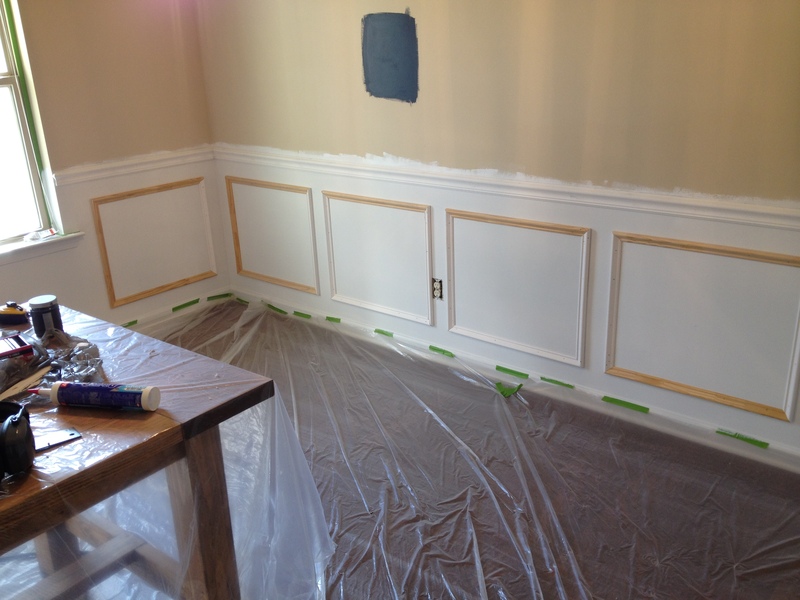 After we had done three coats of white, it was time to lay out the boxes for the picture frame moulding and the chair rail. 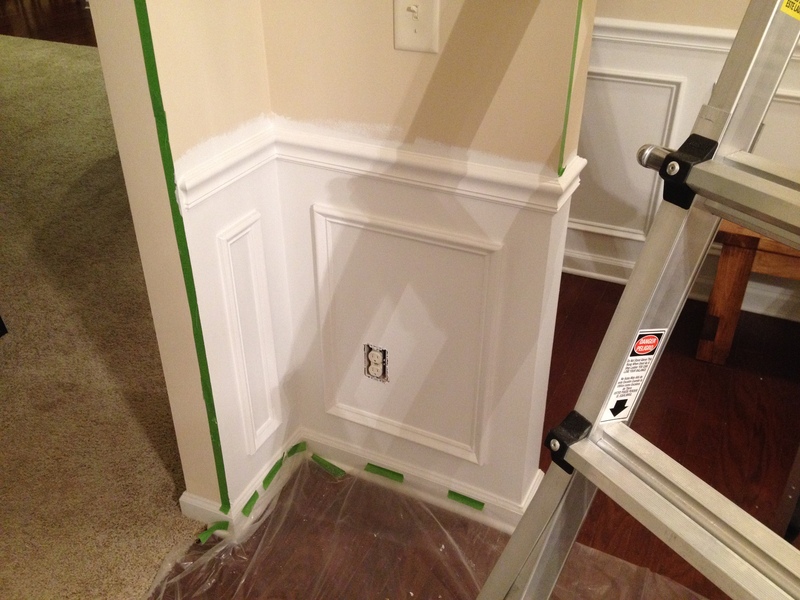 Mandy helped me snap a level chalk line around the top of the room so we would have a reference to hang the chair rail. Then I used my framing square and a level to mark out the boxes. This took FOREVER. A mistake here would make the whole project look wonky and unprofessional so I really took my time and made sure everything was just right. 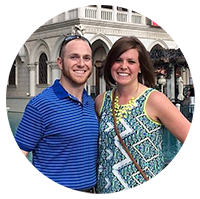 Once everything was drawn out, I consulted my interior designer and project manager (Mandy) to be sure that she was happy. 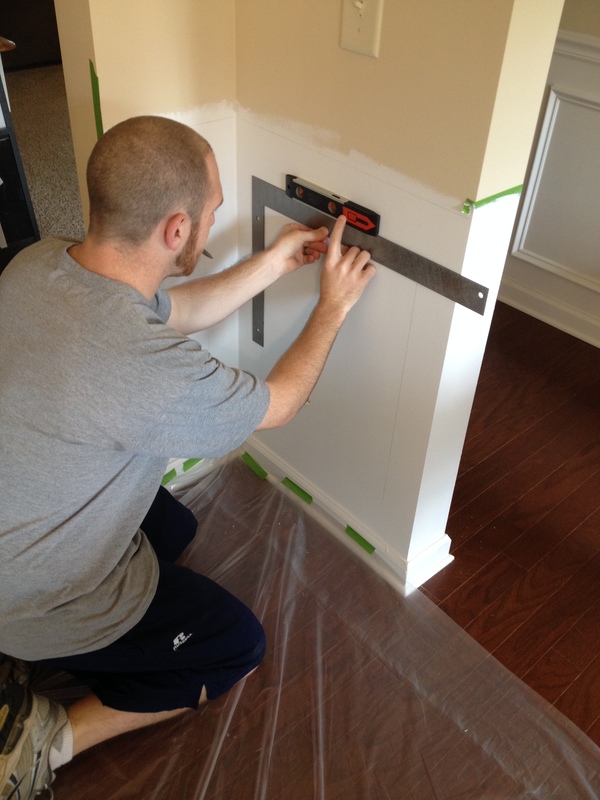 After getting the okay from the boss we could start cutting trim! 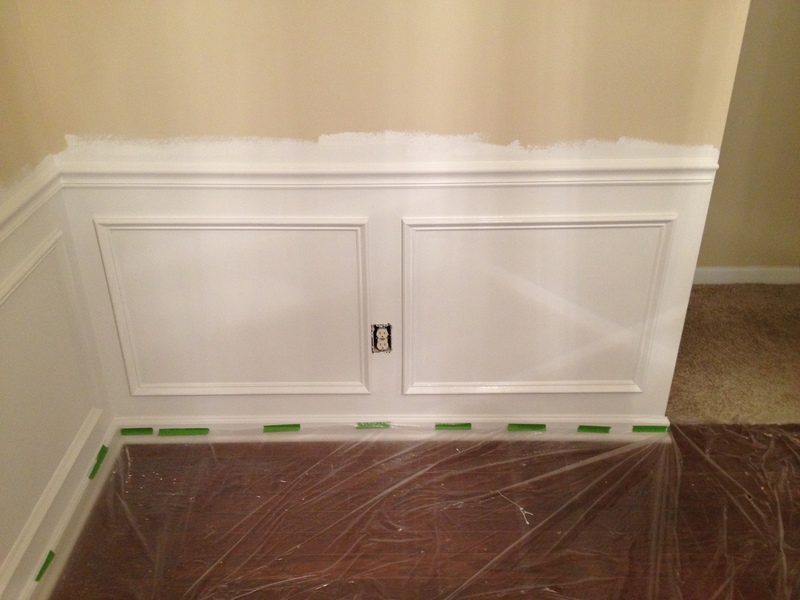 My plan was to hang the chair rail piece by piece to be sure everything fit together perfectly but pre-cut all the moulding. Each piece of chair rail was mitered on the ends and finish nailed into place along the level line we had drawn previously. I wish I could have just pre-cut all of the pieces because it would have made things so much easier. With the picture frame moulding it didn’t matter as much because I wasn’t matching the wall lengths or fitting in corners. 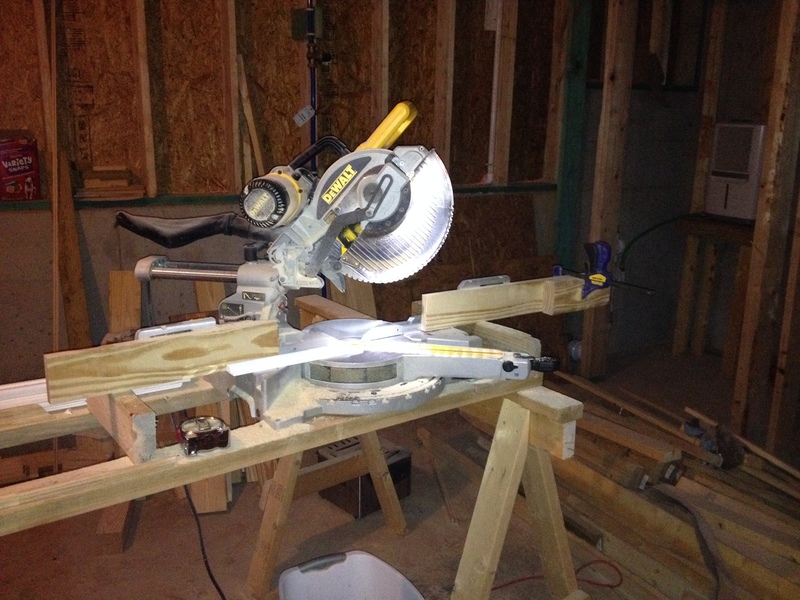 To cut the moulding, I set up a really simple jig on my miter saw. 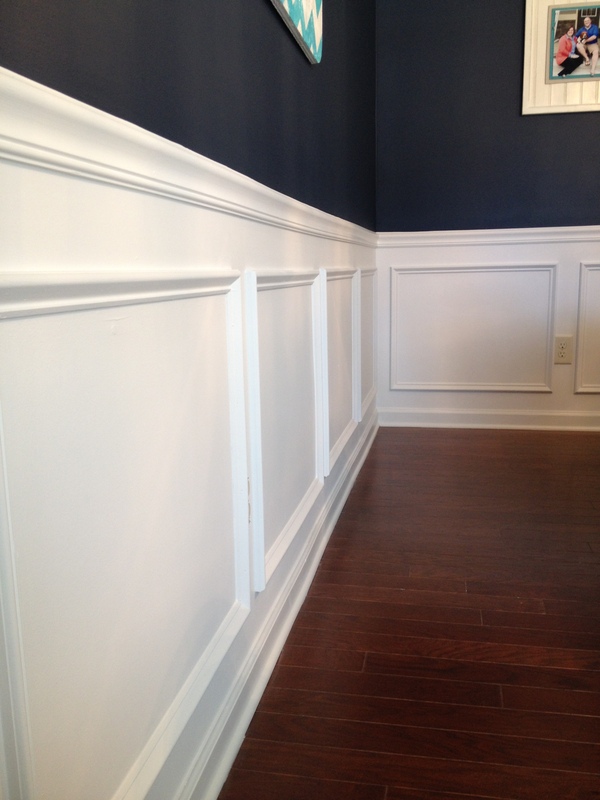 I had to be sure that the tops and bottoms and the verticals on the moulding were all exactly the same length. Making squares makes it easy to spot when corners aren’t actually square! I could adjust the block on the right and then push the next piece up against it to be absolutely sure that each piece was the same length. Next thing I knew I had 44 pieces of trim cut and labeled and it was time to go to town with my nail gun. I would start with the top of each square and use my level and the line I had drawn to be sure it was in the right place. Adding the remaining three sides was a combination of ensuring the corners were tight together, each piece was level/plumb, and nailing it in. I wish I had three hands because it would have made it much easier! I was surprised at how quickly the picture frames went in though. 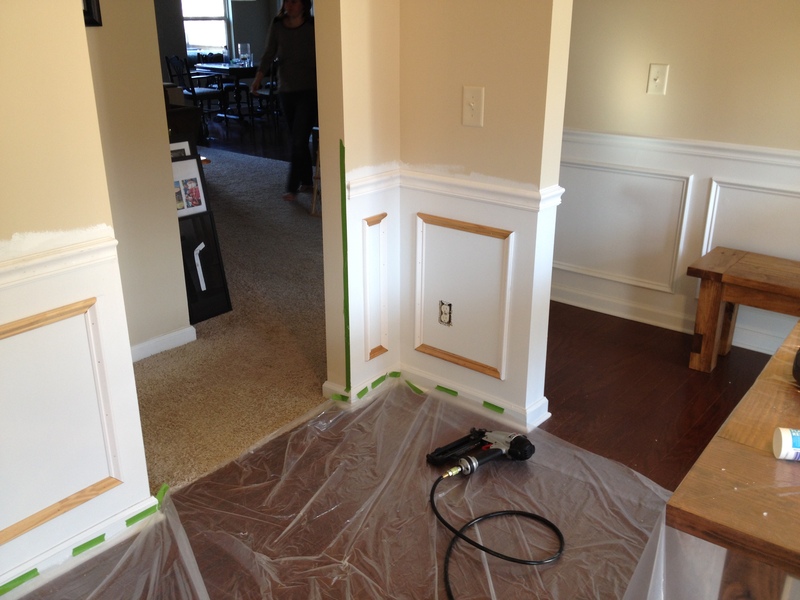 Next it was time for my least favorite part – caulking and sanding. Mandy manned the caulk gun and I went back for spreading and cleaning. 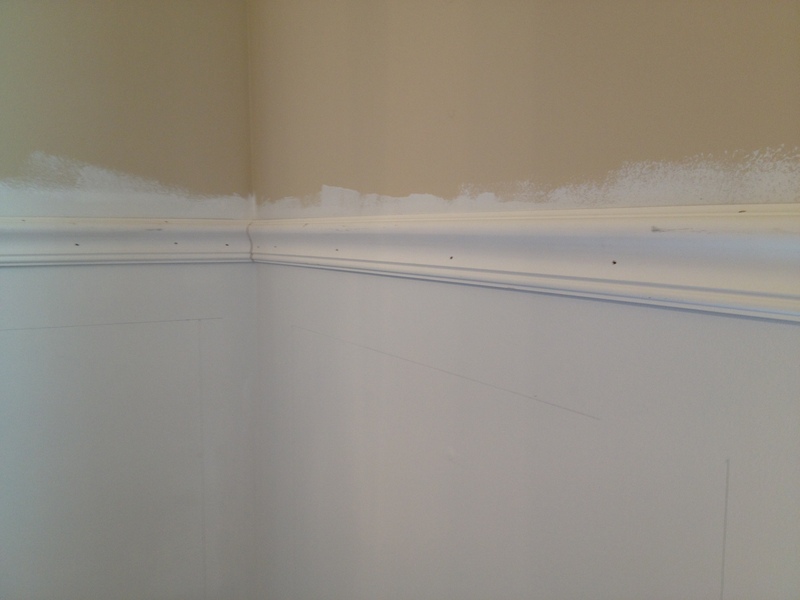 We had to caulk both sides of each piece of trim, each joint, and each nail hole. We used paper towels to wipe off the excess and make all the seams and holes disappear. 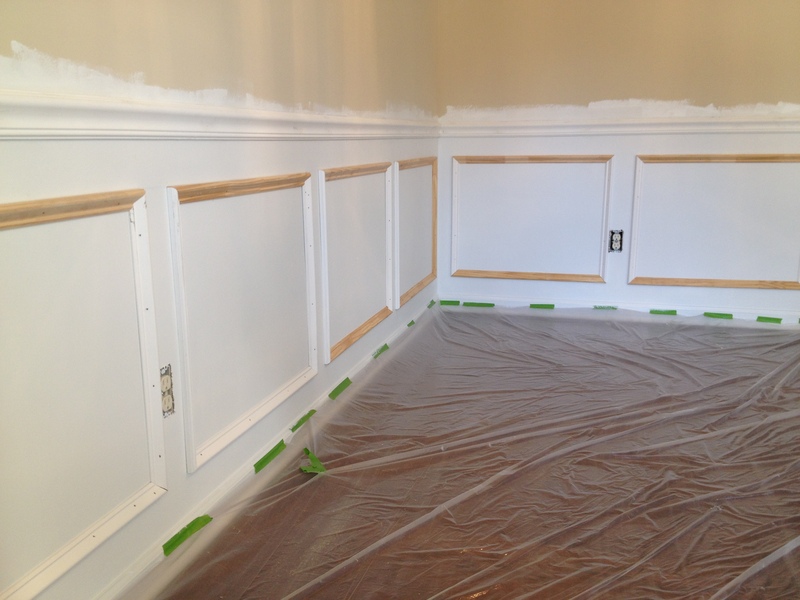 After one coat of light sanding to smooth everything out, we came back with the white paint and did three coats on the trim. 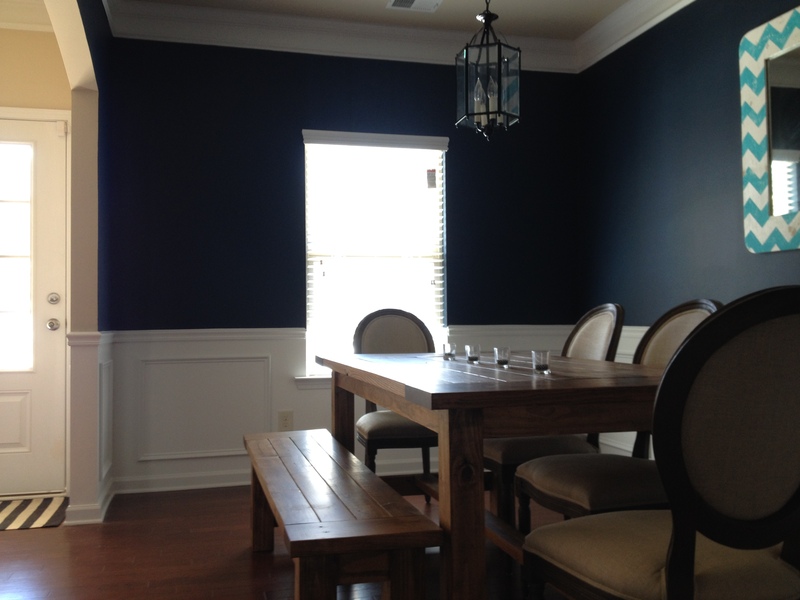 Finally we got to move on to the most dramatic part – painting the navy! 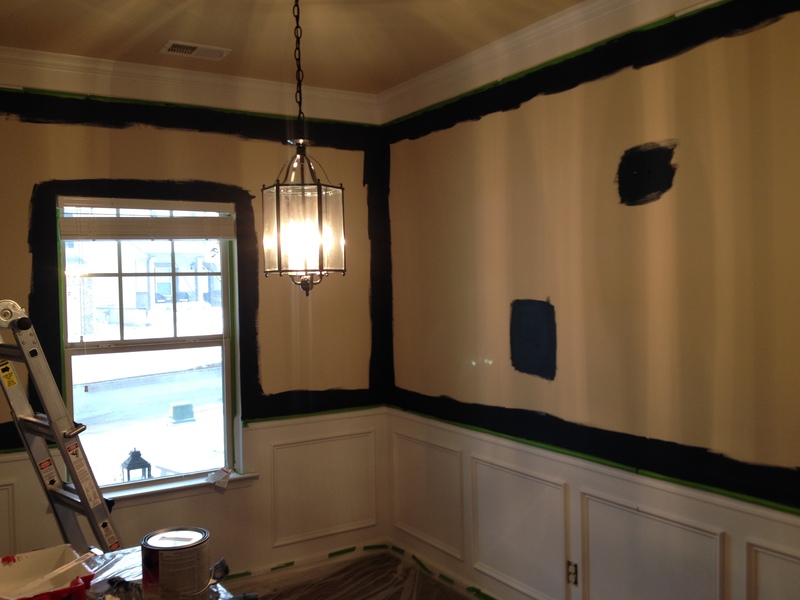 We taped off the new trim and took down the blinds and other things from the walls. 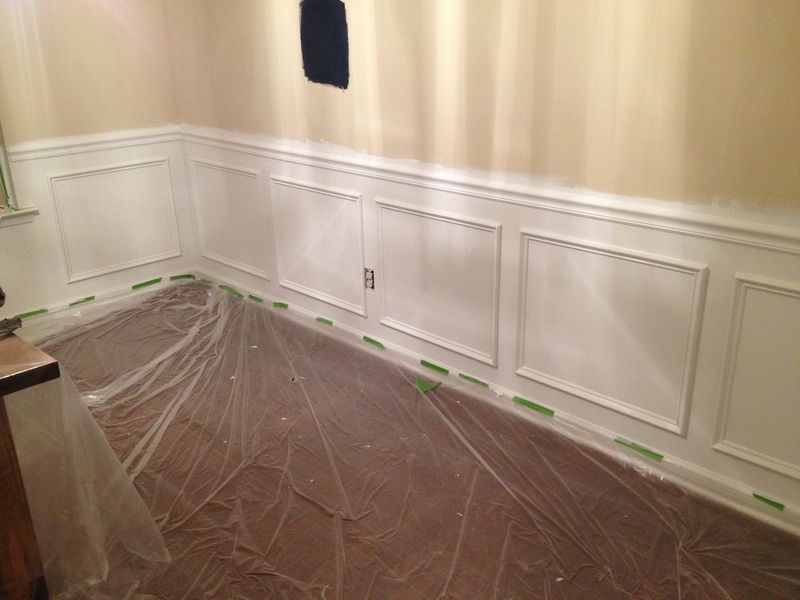 I started by cutting in all of the edges, corners, and doorways with a paintbrush. 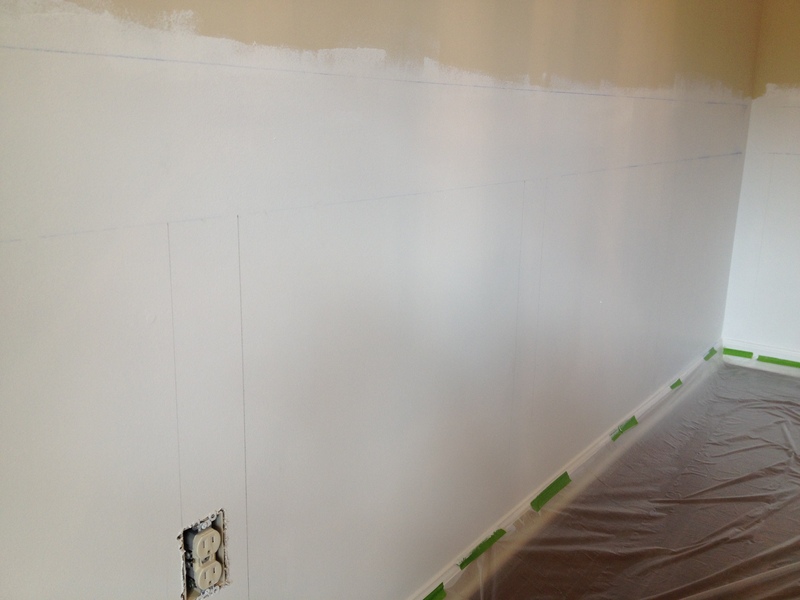 After the edges were cut in, we went back with the roller to finish covering the walls. Mandy had a genius idea that saved us tons of ladder climbing or some money at this point: instead of buying an extension pole for our hand-held roller, we just took the handle off of our broom and screwed it into the roller handle. Boom – problem solved! Then we just stood on the ground and could roll the whole room from there. After three coats I went around all of the taped edges and touched up any spots that needed it. Finally it was all done! We cleaned up, moved the furniture back and admired our work. 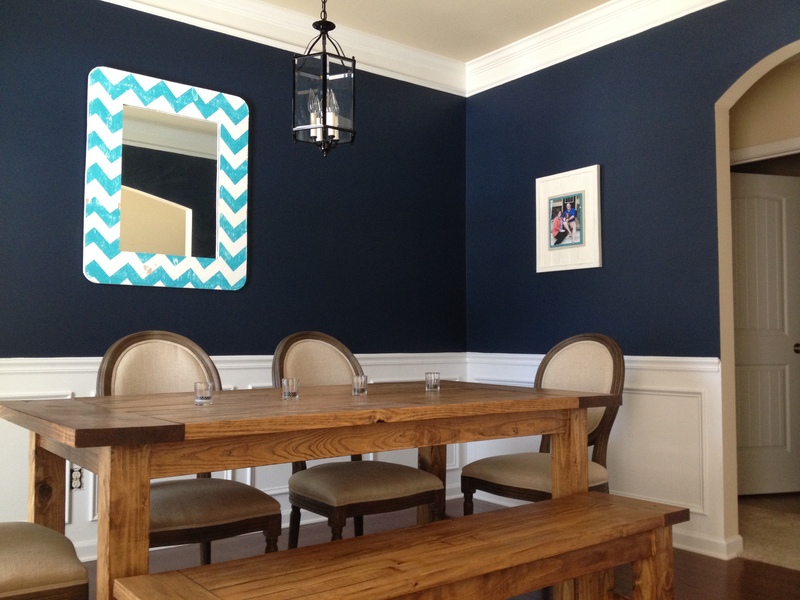 I’m extremely pleased with the way it turned out and I think it completely changes the room. 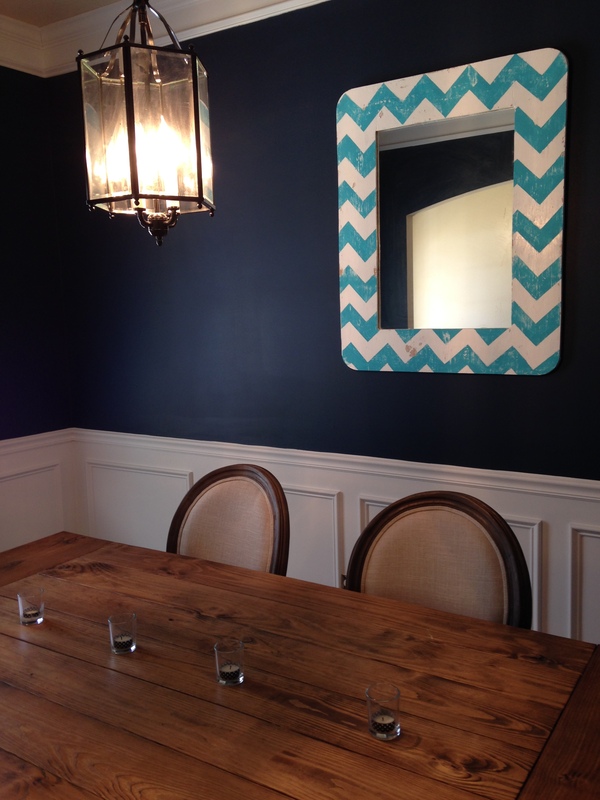 This entry was posted in DIY Projects, Home Tour, Married Life, Uncategorized and tagged chair rail, chevron mirror, dining room, diy, farmhouse table, fox den, moulding, navy, painting, trim. Bookmark the permalink. Conner! When can you come to my house!? 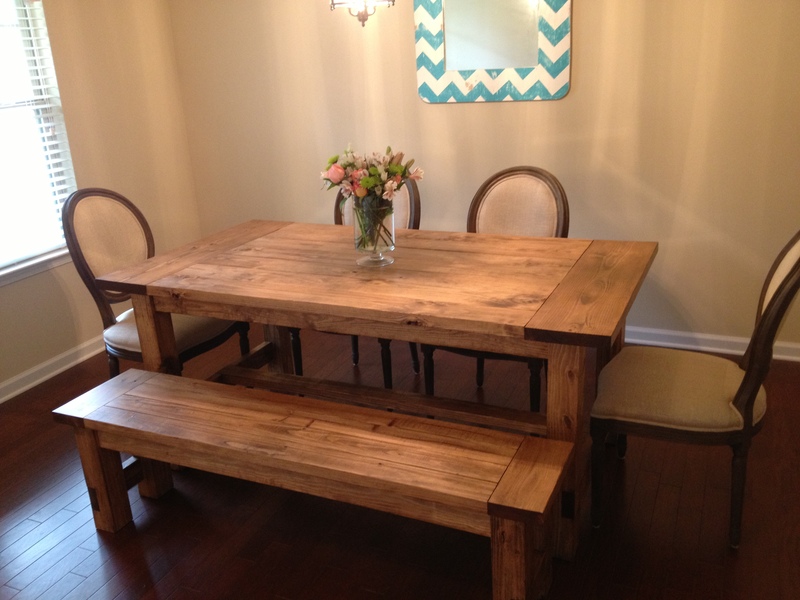 I’m dying for that exact thing in my dining room. Seriously. Next time you make it to Dallas, I’m hiring you! But you’ll need to bring your saw because we have nothing like that. We do need to get out to Dallas soon! When we do, will be calling you.